Ade Sri started Goodiebake.com in 2009 as her media to post her tested recipes cooking and baking as well as sharing with others. As time flies and for love of, especially baking, brought her to make Goodiebake as the label for her made-to-order baked goodies. 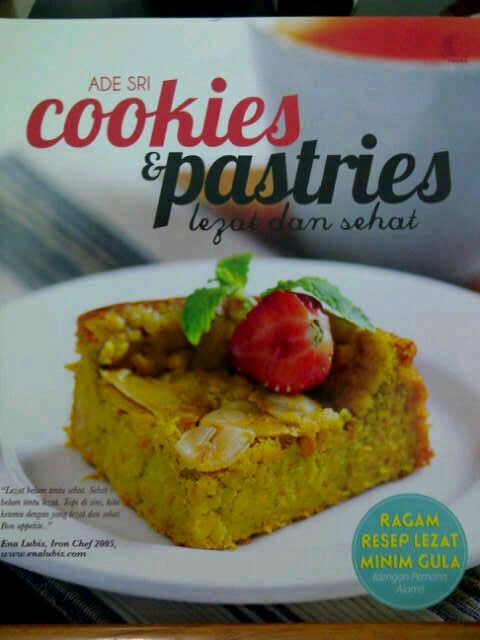 She also launched her first less sugar recipe book in 2012, Cookies & Pastries Lezat dan Sehat, published by Puspa Swara, Jakarta. Goodiebake now offers homemade valued goodies at your convenience with reasonable price. If you’re looking for cupcake giveaways, birthday cake for love ones or simply craving for no-bake klappertaart, you’ve landed to the place where healthy goodies are made. Indulge yourself with Goodiebake’s creamy no-bake vanilla young coconut custard (klappertaart). Available in choice of toppings: original or cheese. Our signature choices of fluffy and moist base cake will become value added to your loved ones yet unforgettable memories to any of your occasion. Try pumpkin (seasonal), chocolate mud, carrot, banana or vanilla cake. Most of them are lessen in sweetness. We also offer less sugar cup/cakes for more friendly variation. Especially for those who love to maintain daily calories of their meal. We will develop more less sugar variant in the future. As our goodies are not pre-made, kindly place your order in 5-day notice for the best project fulfillment. Please call for further request. Thank you for your visit, looking forward to be at your service.